Have You Ever Slipped Up on a Deer in the Snow? No doubt about it, the vast majority of whitetail hunting today is done from some type of elevated platform – treestand, tripod or shooting house. That wasn’t always the case. To this day, many northwoods hunters still practice the age-old art of tracking in the snow. So can you, and here are a few tips to help you along the trail. You’ll usually find an inverse correlation – the less vehicle traffic, the more deer traffic. If you really want to get away from the crowd, and back where the big bucks roam, unload your ATV and ride the least-accessible roads and trails into the more remote areas. Once you find a track, you’ll want to determine a few things, including the age of the track, and the deer that made it. Big tracks means big deer – usually, though not always a buck. Track sizes can vary considerably, but you’ll know a really big one when you see it. And width is often a more important indicator than length. If you’re after a big buck, you want a track at least 4 inches long and 3-1/2 inches wide. You can also judge the relative sinking depth of the track – the deeper the track, the heavier the deer that made it. To determine track age, you need to pay attention to local environmental conditions. When did it last snow? How long has the snow been on the ground? How cold has it been? Did it warm up today and melt out part of the track? What type of snow is on the ground: wet, powder or granular? Do the tracks look like they were made in soft, wet or dry, frozen snow? Some of this will only come with experience, but you can always compare deer tracks with your own boot prints to see how they differ. Once on the track, try to determine what the buck was up to. Was it feeding, following a doe or making time? In either of the former two cases, you need to go on red alert immediately. After feeding, it’ll likely bed. So will a doe, and it’ll bed with her. If and when you feel you’re closing in, it’s time to use your eyes more than your feet. Move slowly and quietly, pausing often and long to scan ahead, and to the sides. You’ve got to spot the buck before it spots, or smells, you. Either mode can be exhausting, both physically and mentally. Hiking in snow takes a toll, and will wear you out. Still, hunting requires tremendous concentration. Don’t expect to find the deer standing in the open, though you may. Move slowly and study the brush, looking for parts of a deer, like a patch of brown, sunlight glinting of an antler, or the tell-tale horizontal line of its back or belly, or movement, like the flick of an ear. 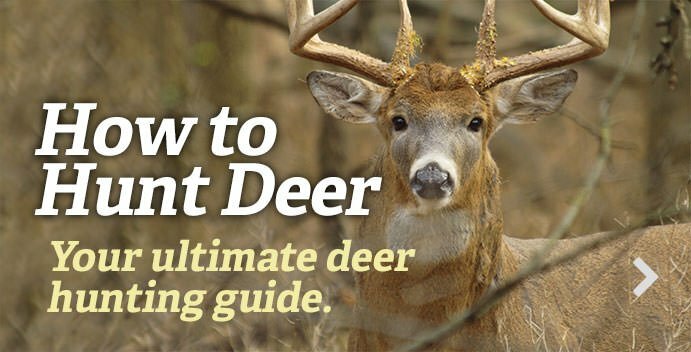 Watch also for sudden changes in the deer’s direction of travel. A sudden change may indicate it’s headed for bed, and may be lying nearby. And always be mindful of the wind. Remember to be safe. Never leave the road without a compass. Leave a note or let somebody know where you plan on spending the day; and always carry a survival kit in case you end up spending the night. Editor's Note: This was originally published on December 13, 2011.